It goes without saying that well-known sites like Apartment Therapy and Houzz are great resources. But there are lots of others out there that can help you cultivate your taste and create polished, authentic interiors. Courtesy of Brim Emery's Designlovefest. Photography by Laure Joliet. What shade of blue is best for your bedroom walls? Where can you find affordable art to complement that vintage bar cart? What the heck is "pantry styling"? Google "design blog" and you'll receive close to a billion search results, each with a great answer. Finding inspiration for your home design projects is so easy these days, it's overwhelming. Instead of trying to absorb everything, choose a few design bloggers that match your aesthetic and bookmark them as your "go-to's." It goes without saying that well-known sites like Apartment Therapy and Houzz are great resources. But there are lots of others out there that can help you cultivate your taste and create polished, authentic interiors. Below, I've listed a few of my personal favorites. Self-proclaimed DIY-enthusiasts and accidental authors, Sherry and John Petersik share every detail of their interior design and remodeling ideas in this blog. Their style is so fresh and charming, even Target was intrigued and launched a home product line inspired by the duo last spring. Apartment 34 can help you remain chic in all aspects of daily life. Erin Hiemstra combines her enthusiasm for fashion and décor with her digital communications experience to give insight on how to add style to everything. In a word: classic and humble. As a full lifestyle blogger, Cassandra Lavalle provides advice and inspiration in the realms of fashion, design and entertainment. A firm believer that life is in the details, she shares classic, meticulous, and eye-catching ideas for interiors that are bound to impress any visitor. Jillian Harris shares insight into her life, food, design and fashion. Her blog grew from her successful interior design business and appearance on the home makeover TV show, Love it or List It Vancouver. Her most recent projects show how to give any room a modern yet cozy touch, interspersed with pictures from her latest lake vacation. And did we mention she was previously on ABC's The Bachelorette? "Bohemian modern style" is the perfect self-describing slogan for Victoria Smith's popular blog. You can tell from the amazing photographs that Victoria is an artist at heart, but the blurbs interspersed between pictures prove that she knows what she's talking about when it comes to style and design. This site showcases the freshest designers, artists, products and trends. With her creative eye, Erika Brechtel is an award-winning brand stylist who crafts unique identities for her clients. She has been described as a tastemaker in home décor and lifestyle. 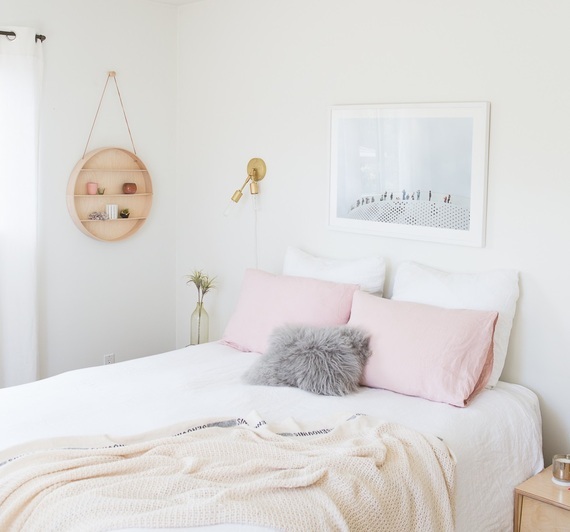 This blog is the place to go for original and creative decorating ideas to help anyone establish their own unique identity. As a spinoff to the popular wedding site, Style Me Pretty, SMP Living is distinctive in the world of design blogs. There are pages for almost any lifestyle topic you can imagine, from home tours to parties to cocktail recipes. Anyone can submit a post to SMP Living, so there are thousands of ideas and perspectives from creative people all over the world. Rue Daily calls itself a "pathway to stylish living," providing the latest on trends, tastemakers, and design tips. As a spin-off from Rue Magazine, Rue Daily is a sophisticated content site with a big reputation and a loyal following. This blog tells a different story than most. The founder, Paloma Contreras, launched a successful interior design business after her blog took off. She was able to build a huge following before she had real-world design experience, proving that her style instinct really makes a statement. If you're looking for more of a European twist to design and décor, this is the blog for you. It applies high-fashion concepts from Paris and London to every lifestyle category, including a how-to section that guides readers through the most classy and delicate projects. The title speaks for itself, showing how to make all aspects of daily life more glamorous. Art director Bri Emery founded this blog out of her obsession with type and images. Her exquisitely arranged layouts mixed with witty captions and a flair for the unexpected attract thousands of readers. Even her high-tech giveaways have a cool, vintage look. In a word: whimsical and airy. Nicole Cohen started Sketch42 after moving to a new apartment without a scrap of furniture. She posted the process of decorating a home from scratch online, and it eventually turned into a personal blog with a flair for the creative. It even includes a hipster-style DIY page that showcases some of the most interesting projects we've seen. This blog is full of interesting and alternative style for all categories of life. Executive Editor Erica posts pictures of the latest high-fashion collections, incredible artwork, and all kinds of beautiful homes for design inspiration. The most unique component of this site is the "Cool Hunting" section that shows you distinctive and rare finds across the Internet. Ultimately, regardless of your tastes or preferences, there is a blog out there that can speak to you and your style. These are just a few of my favorite--what are yours?